Choose What YOU Want – we have over 3,000 choices of fabrics to suit each and every model. You choose what shape and design you desire and we will tailor any of our large range of models to your requirements. Made in Ireland – Each Finline piece is designed by us, handmade in our factory by skilled Irish craftsmen and women. We employ 35 people, most of whom have been with us for over 20 years. Indirectly we help to employ a further 40 Irish Jobs through intermediaries, suppliers and third parties. 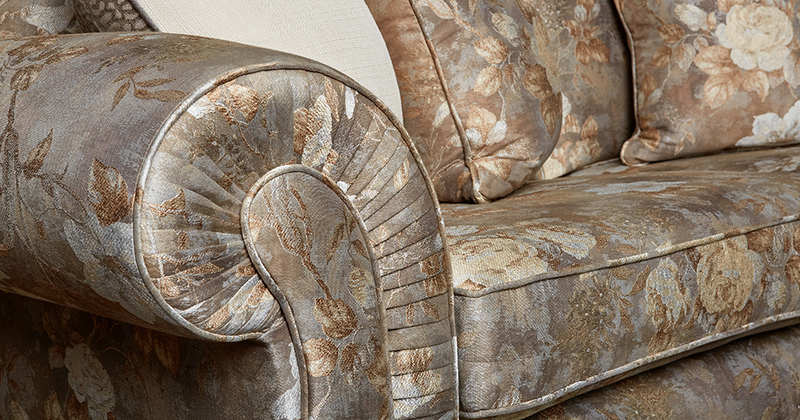 Bespoke – Your Sofa, Your Way – Because we make each piece at our factory, we can custom make every piece. If you want your sofa longer, higher, firmer, softer, different colour legs – the choices are endless and our helpful staff will aid you through every important decision. Pattern & Stripe Matching – If you choose a large pattern, stripe or a medallion fabric we will match, where possible, the pattern on the back cushion, seat cushion and front border. This results in Finline using far more fabric in construction but results in a far better looking sofa or chair. Many manufacturers will not go to such a level of detail when producing their sofas. Symmetry is very important at Finline and our fabric cutters and upholsterers have years of experience pattern and stripe matching. Our Customer Service – We have been building and perfecting the craft of sofa making for 35 years. We have furnished 1000’s of houses during this time and there is very little we haven’t encountered. We love a challenge so please don’t hesitate to ask our staff any questions regarding our products. 20 Year Frame Guarantee – We are so confident in the durability of our frames and springs that we offer a 20 Year Frame & Construction Guarantee. Each frame is made from Kiln Dried Hardwood Beech, this will ensure that your frame will withstand the test of time. We have re-upholstered hundreds of our older frames over the years. Our frames are the most durable and robust on the market today. Re-Upholstery & Recovery Service – If you get tired of your fabric cover in 5, 10 or 20 years time, take a photograph and send it to us ([email protected]) and we will revert giving you a “special Finline recovery price”. We can recover most old Suites. Brass Plate – Every Finline Sofa & Chair comes with a unique brass plate with the Finline Logo. Our foreman meticulously checks every single piece before attaching our Brass Plated Label. Best Prices – Nowhere in Ireland will you find a product of our quality for the same price. We make it. We sell it…. There is no middle man. Quality Guarantee – We strive on a daily basis to improve our offering with regard to our products, designs, fabric selection, and even the advice we give to customer about interiors. Each component that is used in your Finline suite has been trialed and tested to ensure for durability and robustness, from our frame, to the foams and fibres we use in our seat cushions. Quality is at the heart of everything we do at Finline.